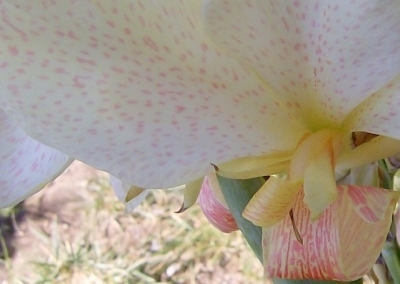 Sugar Lips’ flowers are covered with pink spots. 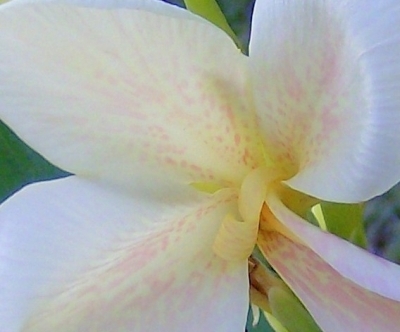 The cannas are beginning their Fall show here, although our weather is still quite hot. These two seedlings are interesting because their color is more nuanced than most cannas. You have to be really close to see the beautiful blending of color inside the flower. 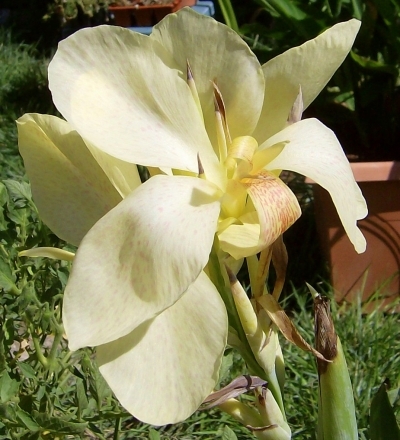 Sugar Lips has pale cream stamanodes (petals) covered with small light pink spots and magenta lines on the labellum (lower petal). The foliage is blue-green. It is from one of Alice Harris’s hand-crossed whites seeds. I’ve decided to plant this one in the ground for further testing.